A grade-school friend of ours was having a bridal shower. Katie mentioned we should come up with a craft to give her. We brainstormed and came up with a collage magnet spoon. 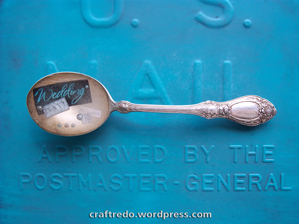 We went through magazines to find words that spelled out the date of the wedding, embellished the spoon with scrapbooking elements and added magnets to the back. Cover work surface with wax paper. Go through magazines to find the words you’re looking for. We wanted the piece to have a ransom note-style. Trim out words, adhere them to the bowl of the spoon with scrapbooking mounting squares. We used tweezers to help with placement. Add scrapbooking embellishments. We had adhesive pearls that were gray and light blue. At this point you could paint the piece with Mod Podge (allow to fully dry before adding epoxy). We opted out of this step. We wanted a more rustic look. The epoxy got under the edges of the words, adding to the rustic feel of the piece. Prop up spoon so the bowl is level. We propped up the handle with the button magnets. Following manufacturer’s instructions, mix up the 2-part epoxy and pour into bowl of spoon. Be careful NOT to over fill the spoon. Bubbles will appear in the epoxy, this is the cool part, blow over the epoxy with a heavy breath. You will notice the bubbles will begin to disappear. Repeat this process, until all the bubbles are gone. A toothpick or safety pin can come in handy to help get rid of the bubbles as well. Attach button magnets to the underside of the bowl and handle of the spoon. Making sure the magnets are level so they both will adhere to the magnetic surface. A birthday spoon would be a neat gift to give. The word ‘day’ is hard to find. ‘Birth’ is even harder, so opt for the letter ‘B’ – ‘Happy B Day’. Bartering is an important part of garage sale-ing. Here’s one of our best garage sale tips that will help you score great deals. Place one-dollar bills in your left front pocket (about $6 worth, divide it into 2 bunches – a $4 bunch and the other bunch will have $2), in your right front pocket have 2 five-dollar bills (separated, don’t put them in a bunch together), back left pocket ten-dollar bill, back right pocket twenty-dollar bill . . . . that way when you are bartering on an item, you can reach in your pocket (grabbing your bunch of four ones) and say ‘All I have is $4, would you take $4?’. Or grab your $10 from your left back pocket and your $2 bunch from your front pocket and state, ‘All I have is $12, would you take $12?’ It sounds funny, but it works. 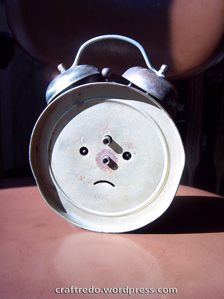 “Cryin’ baby”, is what my youngest would say to me as he brought me this old alarm clock. I (being myself and all my busyness – not paying as much attention to the situation as I should have been), would reply “Oh, is the baby sad?”, thinking he was talking about himself. I would pick him up and kiss him until he giggled. I thought he just needed some extra lovin’ at that time. Finally, my oldest informed me to look at the back of the clock. “It looks like a crying baby”, he stated, and it sure does! Ever since, we have been on a mission to look for hidden faces in every day objects. This summer we decided to make it one of our photographic assignments – to photograph as many faces as we can find. Many are taken on the run, as you can see by the blurriness of some photos. We pull up, quickly take the shot and drive off. It’s a thrill when a face is found, the kids erupt with excitement. We’ll eventually have a photo book made through Snapfish (www.snapfish.com). I like that the kids are a little more observant of their surroundings, paying attention to details. We still aren’t set on some of the titles, it’s a work in progress. Oh, and the pizza photo – that is EXACTLY how it was found. We didn’t alter any of the toppings. Don’t forget to take your camera EVERYWHERE with you. You never know when a face is going to pop up. 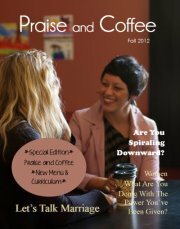 We were given the wonderful opportunity to feature a craft project in the Summer issue of ‘Praise and Coffee the Magazine’. So . . . . if you want to learn how to do this craft, you’ll have to check out this amazing magazine. Preheat oven to 350 F. Grease and flour a 7X11 pan. Cream together butter and sugar. Beat in milk. Add combined flour, salt, and baking powder and stir. Add blueberries. Bake in 7×11 pan at 350 F for 35-45 minutes or until toothpick inserted in center comes out clean. Mix ingredients together, warm and serve over cake. We usually pour over the pieces individually as they are being served, not over the entire cake. ENJOY!! I hate to brag, but I have one amazing hydrangea bush in my yard. This bush is enormous and full of color. It’s a Kaleidoscopic Hydrangea, which is a firework display of bursting colors embracing many shades of blue, pink, purple and green blossoms. My mom was a bit jealous of my growing techniques pertaining to this garden marvel and she would often tease me about this bush. I would claim to be a fantastic gardener, and she would simply state that I just had really good dirt. So I would gladly share my blue ribbon blossoms with her (and many of my friends). I wanted the containers to sparkle as well, so I came up with this little ditty. My mom would have really enjoyed this craft, I miss her so. First, wash and dry your jar. Remove all the labels from it. Wrap the ribbon around the jar, cut to fit. Place scrapbooking mounting squares on the backside of the ribbon (in many areas) so the ribbon won’t slip. Adhere the ribbon to the jar. Using our template (flowertags), print the template on coordinating paper stock. Cut out the tag and circle. Adhere the circle to the jar (with mounting squares), add scrapbooking embellishments (I used these amazing little self-adhesive gems. I also have found self-adhesive pearls that work nice too). Hole punch the tag and slip a rubber band through the hole, attach it to the mouth of the jar. 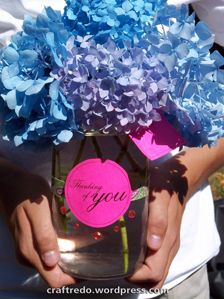 Fill jar with water and your prized posies. When filling your jar, be careful not to get water on your decorations. 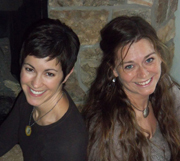 Your recipient will be thinking how clever and environmentally thoughtful you are. I love Pinterest! I have a hard time sleeping at night and often find myself on Pinterest, searching through countless craft inspirations. I notice that many of the projects I ‘pin’ require a canvas. 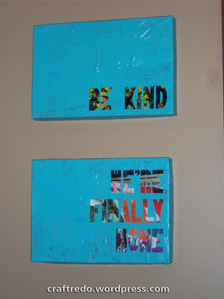 Canvases can be pricey and they don’t follow the ‘recycled/use what you have’ format. 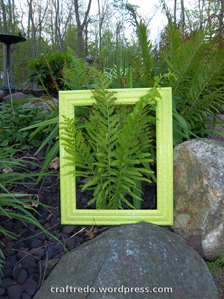 So I was trying to figure out an item that would resemble a canvas, but would be along the lines of a recycled project. That’s when shoebox lids came to mind. Tear pieces from magazines and glue them onto the shoe box lid. I was very sloppy – making sure to leave edges not glued down, this adds to the rustic look. Place lid on wooden blocks, it makes it easier to coat with Mod Podge. Coat entire lid with Mod Podge (front and sides), let fully dry. I tried skipping this step (coating with Mod Podge) and when it was time to peel off the vinyl letters, the vinly letters ripped the magazine pieces. You can see the rips in the ‘We’re Finally Home’ piece. With the help of a ruler, mark a straight line in pencil where you’ll place the vinyl letters. Place the letters anywhere you’d like. I usually place mine along the bottom. Adhere the vinyl letters. Paint the entire piece (including the sides of the lid) with acrylic paint. I found it best to peel the vinyl letters off while the paint was wet. Use an exacto knife to help get the letters off. Allow to fully dry and then coat with a final layer of Mod Podge. Try it. Use a family phrase or your favorite quote. With my family’s constant running when we get home it feels so nice, that’s where ‘We’re Finally Home’ came from. You’ve repurposed two items – magazines and shoe box lids, good job. Now what to do with all those empty shoe box bottoms . . .